A highly important and revealing archive of letters, papers, and photographs of M.K. Gandhi, one of the towering figures of the twentieth century, comes to auction on July 10, 2012 at Sotheby's -London. The trove is estimated to sell for €500.000 - €700,000. ($622,000 - $870,000). 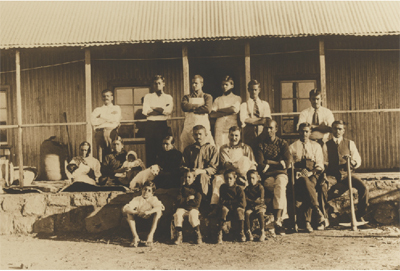 The archive was the possession of Hermann Kallenbach (1871-1945), a German Jew and successful architect originally from East Prussia who had settled in Johannesburg and was Gandhi's constant companion during the great man's last decade in South Africa. They met in 1904. "He used to say to me often that when I was deserted by the whole world I would find him to be a true friend going with me, if need be, to the ends of the earth in search of Truth..." (M.K. Gandhi, March 25, 1945). The years that followed the initiation of their friendship saw Gandhi's political maturation and spiritual growth, the period that prepared him for his future return to and activism in India. 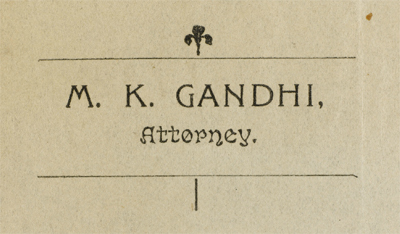 Kallenbach played a key role in Gandhi's life not only as someone who arguably knew him better than anyone else but who played a unique role in Gandhi's transformation from lawyer to Mahatma. This was not a friendship of equals. Kallenbach became one of the first believers in Gandhi's philosophy and struggled to follow his strict and exacting regime. Kallenbach became deeply involved in the struggle for Indian rights in South Africa, was imprisoned in 1913 for doing so, followed Gandhi from vegetarianism to increasingly restricted diets, practiced sexual abstinence, and adopted a simple, communal lifestyle. In 1910 he bought a 1,100 farm twenty miles from Johannesburg and turned it over to Gandhi. The two were closely involved in managing the farm. 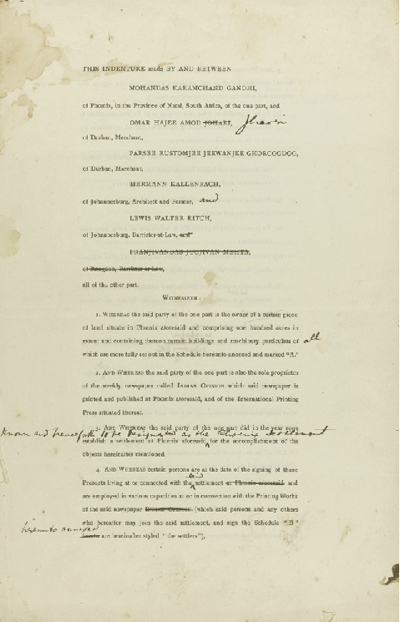 The archive documents the farm's purchase and the friends' acquisition of fruit trees, as well as arguments with neighbors over grazing rights. It was Gandhi's aim to have Kallenbach return with him to India via Britain in 1914 but the declaration of war between Britain and Germany occurred while they were at sea. Upon their arrival in England Kallenback was declared an enemy alien and was interned for the duration of hostilities, afterward returning to Johannesburg. Gandhi had made his way to India but the two friends never lost contact. In poignant letters the archive reveals Kallenbach's deep intimacy with Gandhi's family; he was something of a surrogate father to Gandhi's four sons, two of whom had remained in South Africa. 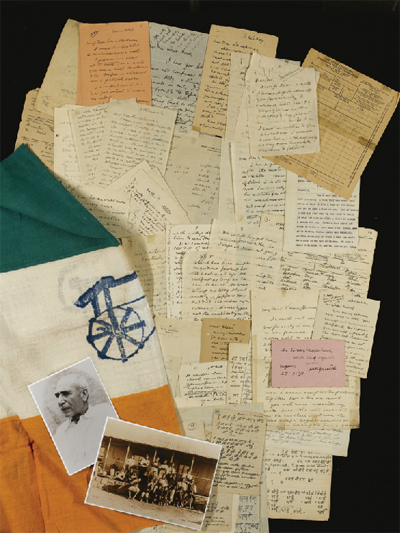 Their letters, along with those from other family members to Kallenbach, provide the richest source yet for insight in Gandhi's personal life in India. Kallenbach would not see Gandhi again until 1937 when he visited his friend and remained in India for two years. 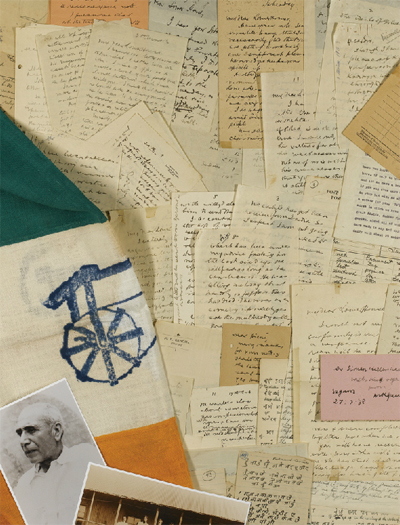 This extraordinarily rich archive stands alongside the main group of Gandhi's letters to Kallenbach (sold at Sotheby's in December 1986) as a testament to this hugely significant figure in Gandhi's life and important member of his inner circle. It is a key and crucial biographical source for Gandhi. Images courtesy of Sotheby's, with our thanks.